COLUMBUS, Ohio (AP) — It was classic John Kasich. 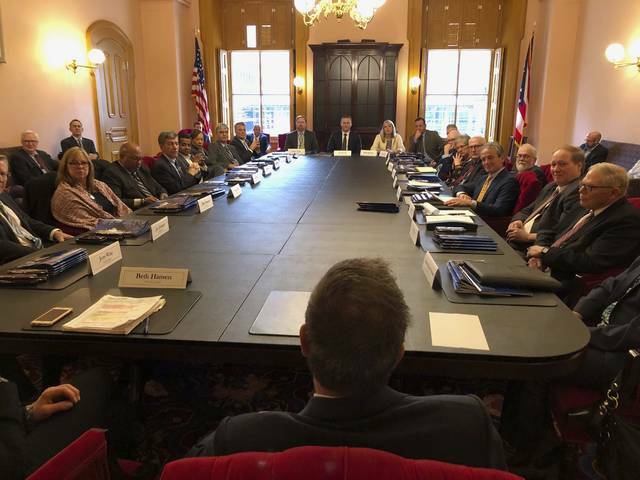 Kasich granted The Associated Press exclusive access to the last Cabinet meeting, held Monday (Jan. 7), a four-hour gathering of 22 agency heads, key aides and a spiritual adviser in his ceremonial Statehouse office. He shared behind-the-scenes accounts of many of the biggest news events of the past eight years, including the state’s deadliest school shooting, threats of a dam failure, an Ebola scare and a battle with fellow Republicans in the Legislature over Medicaid expansion. Cabinet members got their own chance to recall brusque or pointed job interviews with a governor criticized eight years ago for being brash and often insensitive, including the male interviewee who helped Kasich push his wife’s car into the garage, only to be told the governor was thinking the job best suited a woman. The two-time presidential contender ends his eight-year tenure Sunday (Jan. 13), due to term limits. He’s weighing another White House bid or a return to cable television. Kasich and his advisers reviewed the 24/7 nature of handling crisis. He was at a well-lubricated New Year’s Eve party in 2011 when informed there had been an earthquake near an injection well in Youngstown, and at the gym when he was informed of Ohio’s deadliest school shooting. He said he wanted to visit Chardon High School that day, but without disrupting emergency operations. He had a state trooper drive him there. “I told the trooper, I said drive the car around to the back. I don’t want anybody to know we’re here,” he said. Kasich said he got a personal briefing from school officials and worked to mobilize state help. The governor also recalled going back and forth with then-Toledo Mayor D. Michael Collins during an overnight phone call over how to handle a crisis involving the safety of the city’s drinking water in summer 2014. “I said, ‘Mayor, I wouldn’t drink that water if it was the last water left in Ohio,” Kasich told the Cabinet. Aides also recounted “a little incident with the CDC” — when Centers for Disease Control experts were apparently unable to get to Ohio quickly enough during a 2014 Ebola scare and a Kasich staffer put a $16,000 chartered plane on a state credit card. The CDC confirmed the story. “We should have put the Reaganomics on that credit card,” Kasich joked. Kasich confessed to advisers that he was “very, very concerned” for his well-being after he granted condemned child killer Ronald Phillips’ request to delay his execution. The family of Phillips’ victim was livid after Kasich agreed to a delay Phillips said related to wanting to donate a kidney to his mother. Kasich called the family of Phillips’ victim and “got a blast through the phone.” He said he learned from the experience and the next time he reprieved a killer, he met personally with the family. It was still a tense meeting, but he said he shared the story of his parents’ death at the hands of a drunk driver and his “evolution about forgiveness” and it seemed to calm tensions in the room. The 66-year-old Kasich, one of his party’s most vocal detractors of President Donald Trump, said he leaves office with his share of disappointments, including failing to entirely eliminate Ohio’s income tax and failing to implement a more aggressive approach to regulating the persistent algae blooms in Lake Erie. COLUMBUS, Ohio (AP) — Republican John Kasich (KAY’-sik) has a talent agent. COLUMBUS, Ohio (AP) — Former Gov. John Kasich says he’s joined CNN as a political commentator. In this changing world, successful leaders must look each problem squarely in the eye, listen to their customers, and realize how dramatically those customers have changed. No one will survive by practicing politics the way Sears or Radio Shack practiced retail, stuck in the 1950s while the world moved on with Amazon, Uber and others who have broken the mold. For Republicans, this means breaking their own self-made mold of being naysayers instead of doers. It means designing market-driven, center-right solutions that actually solve problems while revealing their compassion. COLUMBUS, Ohio (AP) — The inauguration of Ohio Gov.-elect Mike DeWine will mark a shift away from volatility in a state buffeted in recent years between the shifting ambitions of an outspoken governor and the frequent outbursts of an unpredictable president. Even before taking office Monday (Jan. 14), DeWine, who is currently the attorney general, has moved through the transition process with a methodical calm. He’s laid out his slate of diverse, bipartisan Cabinet picks at amply announced news conferences and politely declined to answer questions that might step on outgoing Gov. John Kasich’s toes. The theme of DeWine’s inaugural — “Faith, Family and Friends” — feels like a dose of comfort food after Kasich’s bold “New Day” and two years of President Donald Trump. A return to predictability may have been in many voters’ minds this fall as they delivered DeWine a comfortable 3.7-point victory over his Democratic challenger, Obama-era consumer protection chief Richard Cordray. DeWine, a Catholic family man who lives on an historic farm in rural Cedarville, will be Ohio’s oldest governor at 72. His governorship will cap a political career that began as an assistant prosecutor in rural Ohio in the 1970s and saw election to seats in the Ohio House, U.S. House, the state lieutenant governor’s office and the U.S. Senate. His style isn’t the only thing that will differentiate DeWine from Kasich. He’s also expressed willingness to embrace some more conservative policies. That includes moving in his final days as attorney general to dismiss a lawsuit challenging Ohio’s congressional districts and saying he’s willing to sign a heartbeat abortion ban that would be one of the most stringent restrictions on the procedure in the country. But whether supporting an abortion bill that Kasich twice vetoed means DeWine’s inauguration will mark a shift to the right for Ohio is unclear. Matt Borges, former chairman of the Ohio Republican Party, said the idea of banning abortions at the first detectable heartbeat has become less extreme as society and science change. 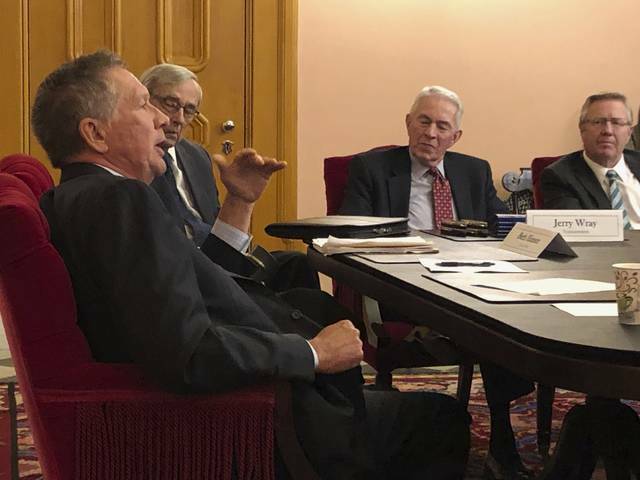 Just three weeks ago, the anti-abortion Ohio Right to Life, which got Kasich to sign 21 of its bills over eight years, adjusted its longstanding neutral stance on the heartbeat bill to support. Kasich enjoyed a popularity driven by Ohioans of both parties, having won over many Democrats with his heartbeat vetoes, advocacy for Medicaid expansion under the federal health care law and his work on bipartisan policy solutions that included a package of “common sense” gun restrictions. DeWine campaigned with both Kasich and the man he often criticizes, Trump, to win the election. He also has a reputation for “governing from the middle,” Dawson said. That has made it difficult for political observers to know what Ohio voters had in mind when they pulled the lever for Republicans this fall. Democratic strategist Aaron Pickrell said he doesn’t believe it was policies that are drastically more conservative. 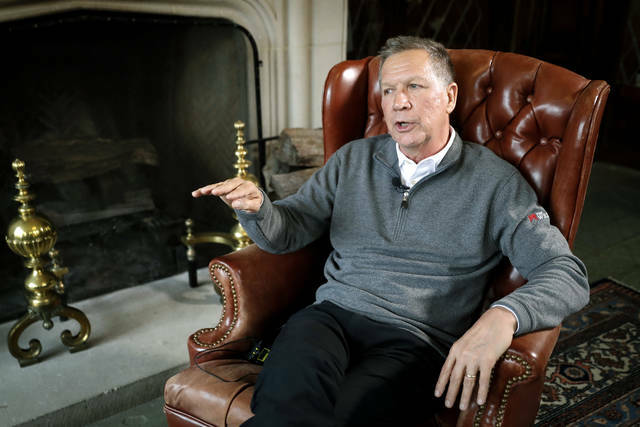 “If Kasich is sort of more of the face of the Republican Party and DeWine’s not a super polarizing figure, I think, to a certain degree, it was more a status quo kind of election here and not a tack to the right,” he said. Justin Barasky, who managed Democratic U.S. Sen. Sherrod Brown’s successful re-election campaign in November, said he believes DeWine will be both a more predictable and a more conservative leader for the state.